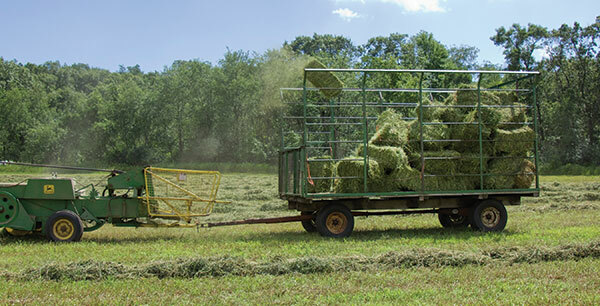 The author is an agricultural extension educator in Jackson County, Fla.
As a county agent for the past 20 years, one of the things I have noticed is that there are two general categories of hay operations. There are “sellers” and “marketers.” The real difference in these two operations is the focus of the owner or manager. In general, farmers spend most of their efforts on production. When it comes to hay production, there are a lot of variables to deal with: machinery, weather, fertilizer, pest control, harvest, and storage. While all of these are vitally important, one area that tends to be overlooked is the sale of the product. “Sellers” focus on what is most important to them and simply try to find customers who like what they produce. While this can be successful, a challenge is inconsistent sales. The goal is to sell at a fair price and move hay as quickly as possible. The problem with this approach is that there is no real relationship forged with the customer. Deals are made based on quantity, price, and perceived quality. One year a customer buys a large quantity and the next year you don’t hear from them. One year all the hay sells in just a few months, but the next year hay sits in the shed and sells only after prices have been significantly reduced. Sellers also tend to rely more heavily on a local market, which are greatly influenced by local supply and demand. Certainly for part-time operations, or producers who are mainly focused on producing hay for their own needs, this “seller” system may be the only real option. It’s also true if your inventory varies greatly from year to year. However, if your goal is to truly develop a business where significant income is going to be derived from producing hay, then shift your attention. A true “marketer” is focused on the needs and desires of their customers. Making this transformation to become a “marketer” requires several key paradigm shifts. The first step is to figure out the profile of the “ideal” customer. In many cases, it is not the large volume buyers. Volume buyers expect a discounted price and special services, like free or reduced delivery. 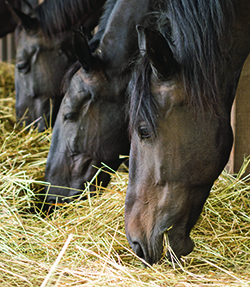 In Florida, the ideal hay customer is the small to medium-sized horse farm that buys square-baled hay almost year around for stalled horses. 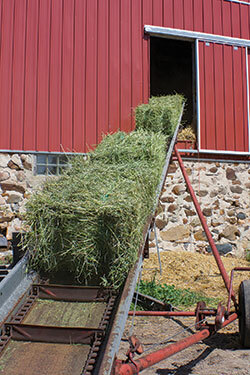 Typically, these farms lack adequate storage to purchase large quantities of hay soon after harvest. Instead, they need a constant supply and recognize that they will be paying a premium for their hay. Selling to these customers means you will either have to provide storage directly for the customer, or work through a local supplier such as a feed store or hay broker for continuous sales throughout the year. Either way, this will require a shift from immediate sales to year-round sales. While this shift in cash flow may not be feasible for your entire inventory in the first year, it may be something you can slowly work toward. The second step is communication. Whether sales are direct with the customer or with a retail outlet, communication is paramount for building customer relationships. This does not have to be elaborate newsletters or a fantastic professional website, but at least enough two-way communication to stay connected. Begin with a simple contact list of your most valued customers. Whether this is an old-school physical address book or a more powerful tool on your computer, the point is to keep track of your customers so you can touch base throughout the year. A simple letter, email blast or phone call can trigger your customers to make you aware of their needs for the year. Many farms are finding that simple social media sites like a Facebook page is a low-maintenance way to communicate, but you do have to get your customers to follow your page. Once you begin to establish a loyal customer base, the third step is to develop a better understanding of their needs and the answers to some key questions: 1) How much hay do they need for the year? 2) How often do they need deliveries or purchases? 3) How satisfied are they with your product? This is going to require some sort of customer record system. It may be as simple as an index card box, a notebook with tabs and records for each customer, or a more powerful Excel spreadsheet with a tab for each customer. Whatever system you develop, the ultimate goal is to figure out how much hay your best customers need, and when they will want it so that you can manage your inventory to consistently meet demand. It only takes one breakdown in this system to lose a valued customer. Hay marketing success comes with building a strong relationship with the customer and producing a product that meets their needs. It is not worth haggling over a few broken bales, how the ants got in a few bales, or how a few off-colored bales accidentally got loaded. Make it right for the customer and they won’t forget it. Haggle and force them to pay full price for an inferior product, and they will not only remember it but will share their frustration with their friends as well. If there are multiple family members or employees working on the hay operation, figure out who has the most patience and the best attitude — let them lead in this area. Your service will be evaluated with each and every transaction. The way to build loyal customers is to go the extra mile to keep them happy, and do it with a positive attitude that shows you genuinely care about their needs. What I have described is a lot of extra work. However, if you want to sell hay to the best customers every year, you have to become “my hay farmer,” or the trusted source they feel confident will treat them right every time. People don’t mind paying full price or possibly even a small premium for excellent service. Consider the businesses that you have become loyal to, and think about the extra things they do to keep you coming back. It may be a lot less effort to simply sell hay “first come first served,” but in the end marketing to a loyal customer base will make your business much more stable and more profitable for the long term. This article appeared in the April/May 2016 issue of Hay & Forage Grower on pages 10 and 11.